The Mr. 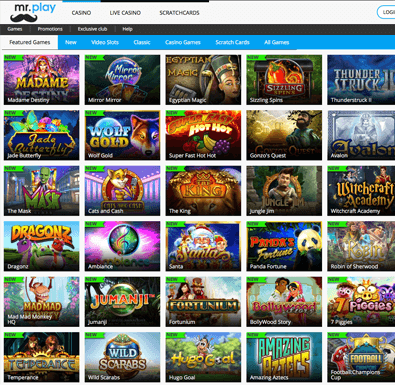 Play Casino site opened its doors back in 2017. Despite being so new, it quickly became one of the talked about online casino sites, and for good reasons. We run a test and let us present you with the results from our Mr. Play Casino review. The Mr. Play casino site might be new, but they are associated with partners and operated by businesses which have years of experience. This is why the Mr. Play casino site doesn’t feel and act like a rookie place to play the online casino games. The site has a lot of good things for it, such as the number of games, easy to navigate interface, clear list of terms and conditions etc. The Mr. Play Casino site has the most popular games in the online gaming community, which is why it doesn’t suffer from gaining users. Another reason is their loyalty program which has a very good system going on there. Let us give you more examples in our Mr. Play Casino review. It’s true that the casino only started its business back in 2017, but in this short time, Mr. Play Casino has gained a solid fan base. This is because they provide something that is truly unique to its customers. Read on to find out what makes the casino stand out from the overly crowded place. Mr. Play has a lot of good software providers on board with them, which is how they quickly managed to serve the customers of different preferences. The high-quality casino games come from the best of the best software providers that are out there. Some major players in the play here are Microgaming, NetEnt, Play N’ GO, Evolution Gaming, NextGen Gaming, Playson, Rabcat, iSoftBet, Thunderkick, Ainsworth Gaming Technology, Quickfire, Elk Studio, Magnet Gaming, Aristocrat and others. Of course, these software providers have some of the biggest games out there. For example, NetEnt’s game Starburst is something of a cult right now because of its immense popularity online. This is also available on the Mr. Play Casino site. Most of these names are pretty common to the regular online casino players, because they have been part of the scene for a while now. Even though Mr. Play is a new casino site, they did partner up with some of the pioneers when it comes to gaming partners. Because of this, the site has quickly gotten above the regular casino sites. The game range is diverse, and there is something for everybody, be it the slots, progressive jackpot, table games or the live casino. Many payment methods available for both international and country-specific players. Welcome bonus offer is decent with a fair wagering requirement. The loyalty program is very interesting. Terms and conditions are transparent. There are no game filters available. The interface of the site is as such that anybody can easily get into, even if they are a complete newbie. The overall site has a very minimal look, so that you can completely focus on the games and the experiences. The base color theme of the site is blue and white. The games pop out really nicely with its light blue color from its stark white background. The site’s logo is also a unique one where the mustache can be seen, to signify the name, Mr.. you can find all the promotional offers available on the site from the top of the site. Once you scroll down, you can find all the other tabs where you can find the different types of games categorized neatly. If you are new to the online casino gaming and don’t know where to start, you can start from the featured game section of the Mr. Play casino site. Most of the time, these are the games that are mostly played. The Mr. Play Casino site has a total of 250 games available right now. Most of these games are slots, with a mix of classic and video slots. There are table games, scratch card games and a live casino on the site. As for slots, the site has over 40 classic ones and over 150 video slots. The slots collection at Mr. Play Casino includes fan favorites like Dragon Wins, Sea Hunters, Planet Fortune and Life of Riches. Of course, the most popular ones are still Starburst, Gonzo’s Quest and Fruity Friends. There are some progressive jackpot slot games available on the site. One drawback we would like to address here is that there is no different subcategory for the progressive jackpot slots, so it is kind of hard to find one unless you know the specific name of the game. Overall the slots collection has a good number of variety going on and should be enough to keep one entertained at hours end. From the table games, there are 7 casino staple table games available on the Mr. Play Casino site. The seven games include 2 video poker, 2 blackjack and 3 roulette games. It is true that the Mr. Play site is lacking on the number and variants in the table games range. Compared to many other competitors’ this is a meager amount. We look forward to more games being added to this category. For newbies, Mr. Play Casino has welcome bonuses for up to first 3 deposits. For the first deposit since registration, one player can get a 100% match for up to €/£200 with 20 free spins. For the 2nd and 3rd deposits, there are no cash bonuses, but you get 40 free spins each. In total, you get 100 free spins and some cash bonus from your first 3 deposits as your welcome bonus package. The minimum deposit required for these 3 bonuses are £10, £20 and £20, respectively. We wish there were more cash money involved in terms of bonus, as is quite usual with most online casino sites. Another shortcoming here is the fact that the spins are only useful for slot players. So if you are more of a table games person, the free spins might not be the best choice for you. Of course, you can still win, but you will not be playing your favorite games to win. This Mr. Play Casino welcome bonus has a wagering requirement of 35X, with 21 days expiration period from the time of claim. This is a fair enough deal, compared to many other online casino sites. As for game weightings, only the slot games count, and from there the video slots contribute only half of it. The worst of it all is that the other games, such as all the table games don’t contribute anything at all towards the wagering requirement. Basically, you need to play at the slots and only at the slots if you plan to fulfil the 35X wagering requirement within the given time period. This is not actually a big problem, but it might become a point of a headache if your preferred method of gambling is not playing slots games. Other than the welcome bonus, Mr. Play Casino has something for their existing players as well, in terms of ongoing promotional offers. The bonus program tries to land the loyal customers in the VIP program, as the ultimate goal here is to be a part of the exclusive club. The loyalty system pays you back with every spin or wager you make, or play anything at all. The bonus points can also be converted into other rewards. The VIP program has 7 tiers, each of which brings forth better and more rewards. You will also get to experience faster cash out benefits, with dedicated account managers and different kinds of boosts. The VIP levels for 7 levels go as per New Member, Bronze, Silver, Gold, Platinum, Premium and Prestige VIP. The last 2 tiers are for those customers who show true loyalty to the Mr. Play Casino site. In other words, you will have to play a lot of games and spend a lot of time to reach there. The loyalty will pay off when you get invited to the top levels. The Platinum stage is open for all players and there is no need for an invitation to be a part of that circle. As a VIP player, you can expect to get many customized offers, monthly paybacks, better wagering requirements, higher deposit amount etc. You will also be able to take part and play in the VIP live tournaments as one of the elites of the Mr. Play Casino site. Other offers include reloading bonuses and ongoing promotions. The reload bonuses occur on every Wednesday where you can get 50% matchup for up to €200. You can get this reward twice by using the promo code MR.PLAY50. To keep up to date with all the frequently run promotional offers at Mr. Play Casino site, we will highly recommend you to subscribe to their newsletter. It is the best full proof way to learn all about the latest ongoing at the Mr. Play Casino site such as latest game additions, next prize draw, bonus deals and contests. A mobile casino site gives one reign to take their game with them anywhere they like. At Mr. Play Casino site, you are free to do that, instead of being stuck in front of your PC all day long. Socialize all you want, without losing sight of your beloved casino plays. The Mr. Play site doesn’t have an app that you can download on your device as off yet. As it’s our duty, we tried the mobile site in our Mr. Play Casino review and here is our verdict. The mobile version of the site can be opened via any browser from your smartphone devices. The site runs on instant play system so conveniently, there is no need for downloading anything. The mobile site is smooth and responsive, and incredibly fast, given the condition of your internet connection. Thanks to the mobile site, you can enjoy the same games you would on the desktop site. The mobile site will run on any iOS, Android, Windows, Blackberry enabled devices. The mobile site also has the same perks as the desktop site, in terms of promotional offers and bonuses. Similarly, you will gain points playing from the mobile site and get to be part of the loyalty club as you accumulate enough points. All 250 games are not available on the mobile site, but they are being added rapidly. If by any chance your favorite is not available on the mobile site yet, be patient, as it will likely get added soon. Also, in the meantime, you might discover something new because your favorite one isn’t there yet. The mobile site looks less clutter to us, compared to the desktop version. The links to everything are on the drop-down menu. The menu slides down from the top left side of the screen. The menu has all the things you might need to find anything. Overall, the mobile site has a compact and nice interface to help you navigate through the site without any issue. The live casino only has two variants of table games, Baccarat and Roulette. These two are not enough to give the full live casino experience. We wish they at least added the Blackjack table. The live casino game section is powered by Evolution Gaming, so it made us wonder why the Blackjack game wasn’t included to site. The live casino is available on both the desktop and mobile sites, and they look and feel similar on both platforms. This is certainly a plus point as the whole point of playing at the live casino is getting the feel of the real deal. The live casino will definitely become complete once they add both Poker and Blackjack options. The Mr. Play Casino site has around 20 different types of payment methods, so there should be something you will be able to use for the deposits and withdrawal. In terms of fees and duration, Mr. Play Casino site seems to have fair enough policies. The available payment methods at the Mr. 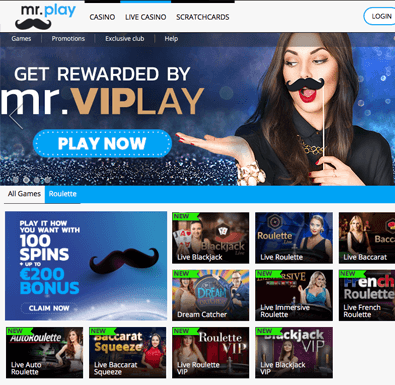 Play Casino site to make deposits are Skrill, Neteller, MasterCard, Visa, GiroPay, Trustly, Zimpler, Paysafecard, instaDebit, Entropay, EPS, Skrill 1-Tap, Euteller, Sofortuberwaisung, Fast Bank Transfer, Mister Cash and Bank Wire Transfer. The available payment methods to make withdrawals at the site are Skrill, Neteller, MasterCard, Visa, Zimpler, Mister Cash, Paysafecard, Giropay, Trustly, EPS, Euteller, Entropay, Sofortuerwaisung, Fast Bank transfer and Wire Transfer. The accepted currencies are USD, EUR, AUD, GBP, CAD, SEK, NOK and BRL. Generally, all the deposit transactions are instant, where you will see the amount credited to your account as soon as you make the payment. The bank money transfer is one exception, which can take up to 6 business days. As for the withdrawals, the pending process is maximum 24 hours. After the request is processed, the duration of time to get your money in your account will depend on the payment method. eWallets such as Neteller and Skrill are the fastest, where it will take up to 3 days to get your money. Debit and credit cards can take up to 6 to 8 days. The time duration of Mr. Play casino site is similar to other online casino sites. The maximum withdrawal limit is £5,500 per month. As for frequency, it depends on the payment method you choose. The customer support service at the Mr. Play casino is somewhat shaky. We think it comes down to each user’s individual experiences, as some agents tend to be not capable of answering even the most basics of the casino. Some also tend to be not aware of the casino jargon. Nonetheless, all the people working for the customer service are indeed very friendly, and they do try their best to help you out. The live chat support is available from 6:00 to 23:00 GMT. If you want an urgent fix, it is better to reach out via the live chat option. If your waking hours don’t fall on their live chat window, you can opt for an email then. You can fill out the contact us form from the help section of the site, and someone will reply back. Or, you can send a direct email to [email protected] Alternatively, you can reach out via phone at 020787622. The customer support is available in languages other than English, including Norwegian, Finnish, Swedish and German. The Mr. Play casino site is owned by the Marketplay Ltd. and is operated by the Aspire Global International Ltd. The company started its business in 2017 and has partnered up with the pioneers of the software providers industry so far. The games from the software providers are the reason why they attract players, despite being comparatively new to the game. The site is licensed under the UK Gambling Commission and the Malta Gaming Authority. These two licenses should be indication enough that the site is deemed secure by the online gambling authorities. The Mr. Play Casino site also has the seal of iTechLabs, which is another indication for its safety. The Mr. Play casino site is fair when it comes to treating its players, be it the promotions or the games. The games all run with a random number generator, to keep the end results completely random. There is no way to rig the game and you have an equal chance of winning as anybody else. The site is accountable for its actions because of the licenses. Any unfair business will result in an investigation and there is a possible risk of shutting down the entire business, hence the Mr. Play casino site is dedicated to keeping everything fair for their customers. The Mr. Play casino site has impressed us, despite being a new one, and some minor drawbacks here and there. They do have a good range of games with a fair enough welcome bonus offer. The ongoing promotions are also quite good, and the benefits of the loyalty program are quite tempting. Overall, Mr. Play casino site is worth checking out. After our Mr. Play Casino review, we would like to point out, however, that the short offer of Live Casino games is greatly compensated by the huge amount of slots available on the site. Fun and excitement are guaranteed. We hope you liked it as much as we did!